Viewing entries tagged with mail. Return to full view. Posted on Jul 8, 2010 at 20:06. 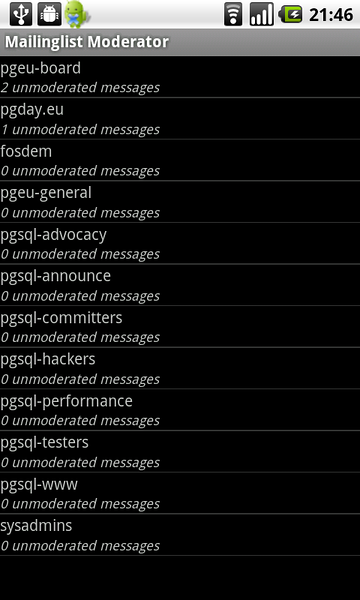 Tags: android, lists, mail, mailman, majordomo, postgresql. Every now and then, the discussion about why it takes too long for messages to get approved when posted to some of the PostgreSQL mailinglists comes up, and it goes around a couple of laps. Maybe we get a new moderator. But eventually it comes back down to not enough people. Personally, I've usually just found myself not having the time to keep up with moderation. So when I needed a project to learn some Android development on, I figured this could be an interesting (probably) and useful (maybe) topic. So, meet Mailinglist Moderator. A tiny android application that helps with the daily moderation chores for anybody moderating Mailman or Majordomo2 mailinglists (should be easy enough to add more list managers if there is any that people actually use). The application will simply enumerate all unmoderated items and let you set them to accept or reject either one by one or in batch. Personally, I've found it makes it a lot more likely I will do moderation - it's literally down to 30 seconds while waiting for a bus or train, or something like that. And once the hurdle is gone, it's a lot more likely I'll end up actually moderating. I found it useful - hopefully others will as well. Here are a couple of screenshots showing what the application looks like. And of course, this is all BSD licensed open source, so any contributions are welcome!